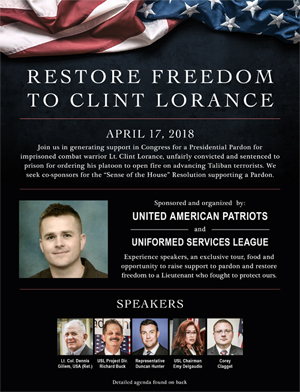 Speakers for the April 17 “Restore Freedom” Day. Congressmen Scott Perry and Louie Gohmert have joined colleague Duncan Hunter to speak to the group at the House Rayburn Bldg., while the others shown here will speak at both the day evens and the evening’s conference and rally. 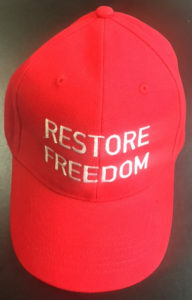 RESTORE FREEDOM baseball caps will be given out free to those who join us in DC and only $5 for those who attend evening Freedom Leadership Conference. Operation Restore Freedom is in full swing with a day packed with activities on Friday but how about you? Can you take time out this week to join in some part of what is scheduled for Tuesday? It shocks people to learn this but the truth is, there are American combatants being held as prisoners, not in a foreign country but right here in America at Fort Leavenworth prison, sentenced because they did their duty but under the “rules of engagement” of President Barack Obama, they were locked up. The details are all different. But what they have in common is that like Lt. Clint Lorance, sentenced to 19 years in prison for ordering his men to open fire on advancing Taliban terrorists who would not stop as ordered, it is wrong what happened to them. They should all be pardoned by President Trump. All of us should speak out for them. We need you with us for all or some part of Tuesday, RESTORE FREEDOM DAY. Our previous two posts tell you the details about Tuesday. We were pleased to announce that three U.S. Congressmen have replied to our invitation message hand delivered to them all on Thursday and with a “Dear Colleague” invitation letter sent by Congressman Duncan Hunter the previous week. The three Congressmen are Scott Perry, Louie Gohmert and Duncan Hunter. You have the choice of joining us early on Tuesday to include breakfast in DC at the House Rayburn Bldg. ground floor cafeteria, or at lunch time at the House hearing room we have reserved and the followup briefings that include three U.S. Congressmen as previously reported. Or you can join us as a $50 host committee member for dinner at Bob Evans Restaurant (dutch treat) at 6 PM (any donation of any amount for those who spent the day in DC with us). Or come to the “Restore Freedom” Rally at the Freedom Leadership Conference. Those who can come to the DC briefing get this band new RESTORE FREEDOM baseball cap to wear during the briefing. If we have leftover hats they’ll be available to conference attendees (who are asked to pay $5 at the door) for only $5 (below cost) as long as supplies last.